Soft, late afternoon lighting makes for beautiful portraits, no matter the subject. When it's a bridal portrait, it can render some stunning results. 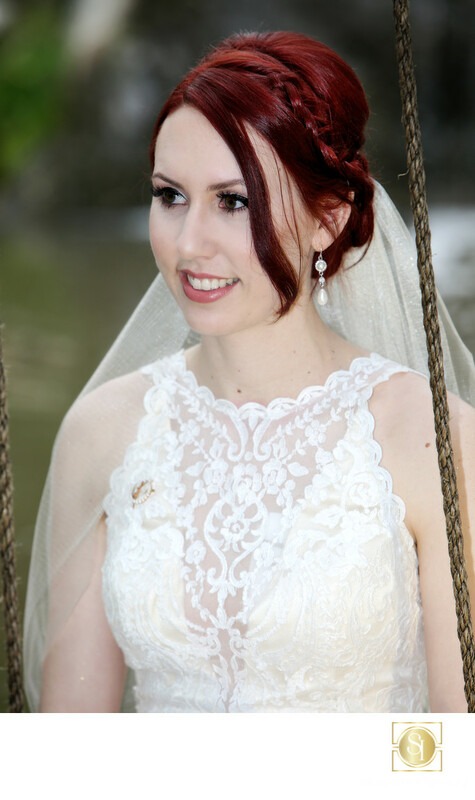 Shooting with a fast lens renders backgrounds nicely out of focus, centering attention on the bride in the foreground. The way the setting sun hits her hair highlights the beautiful color and outlines her shoulder and veil. Shot at Paradise Falls in Oceanside, near the "Wedding Pond." Keywords: Oceanside Wedding Photographer (6), Outdoor rustic Wedding (15), Paradise Falls wedding (12), Paradise Falls Wedding Photographer (6).